There are a lot of great drizzles in the world. A drizzle of honey over thick Greek yogurt. A drizzle of chocolate atop an old-fashioned buttermilk donut. A cold drizzle on a gray Parisian day that causes you to duck into a cozy bistro for a bowl of soup and a long afternoon with a bottle of wine. But for my money, the greatest drizzle of them all, the drizzle that makes all the difference, is the drizzle of a good, fruity olive oil over a plate of pasta. You’ll often find the idea of the “drizzle” gone badly astray in Italian-American restaurants with names like Papa Tony’s — sad swirls of tomato-dressed spaghetti drowning in a pool of orange oil. But the opposite — which you’ve likely been served in the homes of friends — is nearly as bad: limp pasta, naked and white, barely sauced, practically pleading for a drizzle. Mario Batali says that Americans oversauce their pasta; that sauce should be the “condiment” to the noodle. And I agree. I’ll often toss a pasta in a very light sauce, what seems like not nearly enough for the noodles it is dressing. Then I will plate the pasta, which will look naked and alone. But at the last possible moment before serving, I will give it a drizzle of olive oil and a sprinkle of flaky Maldon sea salt. And the result will be fresh, delicious and gleamingly proud. Much like Lucy Ricardo requesting ketchup for her escargots in France, we’ve gotten over our aversion to insulting a host. We’ll often ask for some olive oil when eating pasta at a friends house. 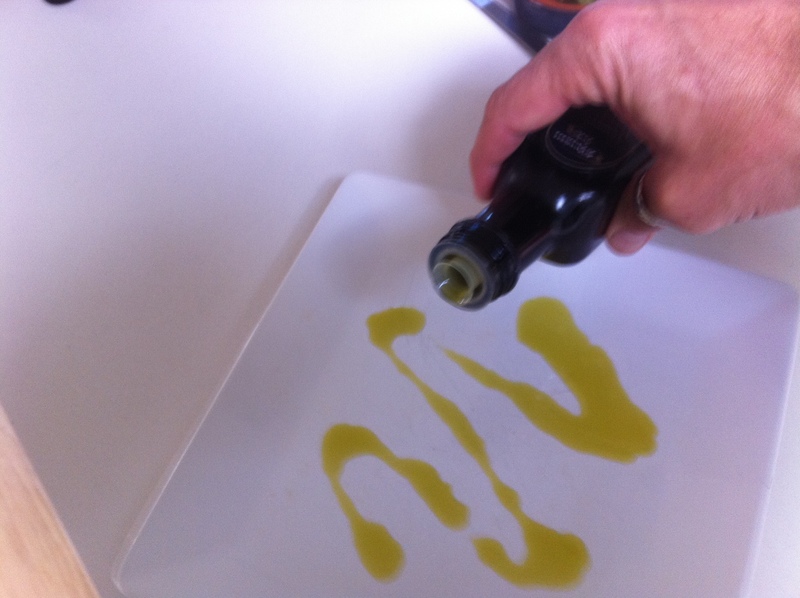 “What’s that for?” they’ll ask, and I explain by way of sharing an old Italian cooking tip that a little extra drizzle of olive oil is a great way to make their already delicious pasta taste even better! People are usually happy to receive constructive criticism wrapped up in a compliment. Here, then, is a wonderfully simple pasta that illustrates beautifully the drizzle that can make all the difference. Enjoy! Heat a large pot of water, salted liberally, to a boil over high heat. Add your penne and cook according to instructions to al dente. Meanwhile, in a very large saucepan, heat olive oil over medium high. Add garlic slices and cooking, stirring, until golden — about 1 minute (do not let brown). Add crushed red pepper, if desired, and reduce heat to medium. Add swiss chard and toss to incorporate. Sauté for about 5 minutes, stirring frequently, until cooked. Reduce heat to low. When pasta is cooked, remove from heat and drain, reserving 1 cup of the pasta water. Return pan with chard to stove over high heat. Add penne and pasta water, and toss. Cook for about 2 minutes, until sauce thickens. Remove from heat. Divide pasta among four to six plates, making sure swiss chard gets evenly distributed. Drizzle any remaining sauce over pasta. Then drizzle each serving with your best extra virgin olive oil, roughly 1-2 tbsps. per serving. Sprinkle with flaky sea salt, grate fresh parmesan over the top, and serve. I went to an olive oil tasting in Healdsburg at a friends home and among maybe 6 choices, some VERY expensive Trader Joe’s won the blind tasting so if possible taste before you buy. I didn’t think they had anything expensive at TJs. Was just in Healdsburg last week passing thru to the Benbow Inn to meet friends. Lovely place. Hope you and Bruce are well. Wearing my Healdsburg Farmer’s Market T-shirt with pride! Drizzle, drazzle, druzzle, drome, Help me Mr. Wizard . . . what would Tooter Turtle opt for his sauteed greens?